The Borchardt C-93 (Construktion 93) semi-automatic pistol was designed by Hugo Borchardt (1844–1921) in 1893 based upon the Maxim toggle-bolt design. Borchardt also developed the high-velocity bottlenecked 7.65×25mm Borchardt cartridge for the C-93. Borchardt's assistant at the time, Georg Luger, also claimed to have influenced its design. Machine tool manufacturer Ludwig Loewe & Company of Berlin, Germany, produced the C-93 in anticipation of military orders. With about 1,100 manufactured by Loewe and nearly 2,000 more produced by Deutsche Waffen und Munitionsfabriken, the Borchardt C-93 was the first mass-produced semi-automatic pistol. DWM employed Georg Luger to promote the Borchardt pistol in military and commercial channels. The pistol was tested by the U.S. Navy as early as 1894 and later by the U.S. Army. Although it was accurate and its rate of fire was rapid, the Borchardt pistol was expensive to produce and unwieldy to handle due to its almost vertical grip and distribution of weight. Furthermore, its recoil was unexpectedly powerful. These criticisms were noted in the Swiss Army field tests. However, Borchardt refused to make any changes to his original design. DWM then appointed Georg Luger to make the requested improvements to the pistol. Luger took the Borchardt design, using the shorter 7.65×21mm Parabellum cartridge, which allowed him to incorporate a shorter stroke of the toggle mechanism and a narrower, angular grip. 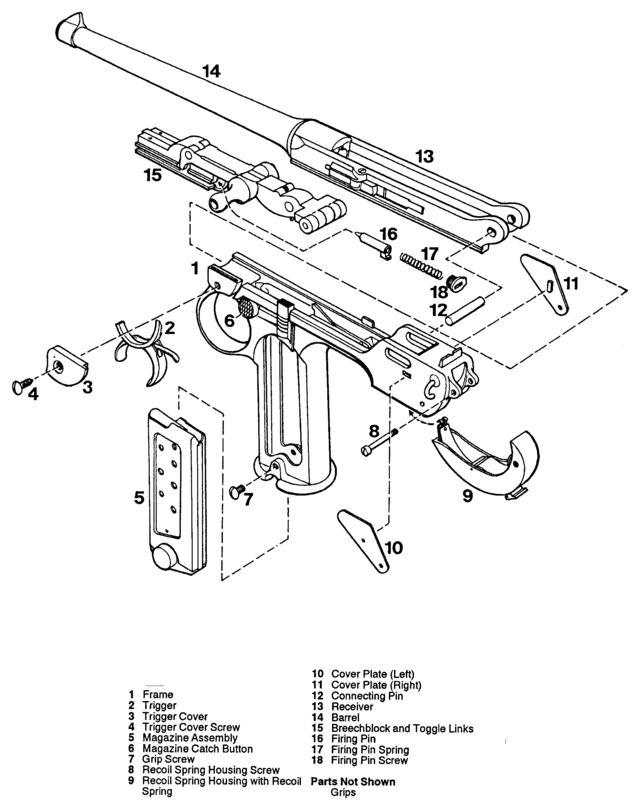 Luger's design eventually became the Luger Parabellum pistol. The cartridge used in the Borchardt C-93 Pistol was the basis for the primary cartridge used in the Mauser C96 pistol (7.63×25mm Mauser); they have the same dimensions, but the 7.63 mm Mauser generally had a more powerful powder charge (contemporary loading data indicated it took approximately 20% more powder than the Borchardt) and is considered to be too strong to be used in a Borchardt C-93. Nonetheless, cartridge boxes from some manufacturers were marked "For Borchardt and Mauser Automatic Pistols." The Borchardt C-93 was manufactured and sold solely in its proprietary caliber, the 7.65×25mm Borchardt. Some test models were made in 7.65×21mm Parabellum and 9×18mm Borchardt, an experimental bottlenecked cartridge developed in 1902. ^ a b Antaris, Leonardo M. (2017). "In the Beginning". American Rifleman. National Rifle Association. 165 (10): 76&77. ^ Bull, Stephen (2004). Encyclopedia of Military Technology and Innovation. Greenwood Publishing Group. p. 45. ISBN 1573565571. Goertz, Joachim and Sturgess, Geoffrey The Borchardt & Luger Automatic Pistols, Brad Simpson Publishing and G.L. Sturgess, 2010 and 2011, ISBN 978-0-9727815-8-9. Hogg, Ian and Weeks, John, Pistols of the World, Fully Revised, 3rd Edition. DBI Books, Inc., 1992, ISBN 0-87349-128-9. Wikimedia Commons has media related to Borchardt C93.